Apologies in advance for writing another Daytona article in which Fernando Alonso is the chief subject, but it’s kinda hard not to. That’s because Alonso, along with Jordan Taylor, Kamui Kobayashi and Renger van der Zande have won the 2019 Daytona 24 Hours - albeit not in a ‘normal’ fashion. After a fairly regulation first half of the race, rain started falling overnight and never really stopped. This led to a ton of long periods spent behind the safety car and two red flag periods - the last of which came with over two hours left of running and turned out to signal the end of the race. Race organisers did everything possible to get as much racing in as possible but try as they might, several drivers were powerless to stop themselves spinning, aquaplaning or colliding with each other. The car in the lead at the time of the stoppage happened to be that of Fernando Alonso, who’d passed the No.31 Cadillac of Felipe Nasr after Nasr - who was setting a searing pace - went off at the first corner. A result was declared with 11 minutes left on the clock, giving WTR its second Daytona win in the last three years. It was a completely deserved win, too - the team spent much of the race either near the front or in the lead, and there were times when nobody could get close to the pace of the drivers, especially once it was wet. In fact, had it not been for a few caution periods, it’s not unreasonable to suggest that they could have lapped the field. Alonso was especially brilliant. In his first stint he went from ninth place to the lead and pulled out a healthy gap, only to have it nullified by a caution period. He pulled out the gap again and handed over to Kobayashi, who maintained the lead for his time behind the wheel. 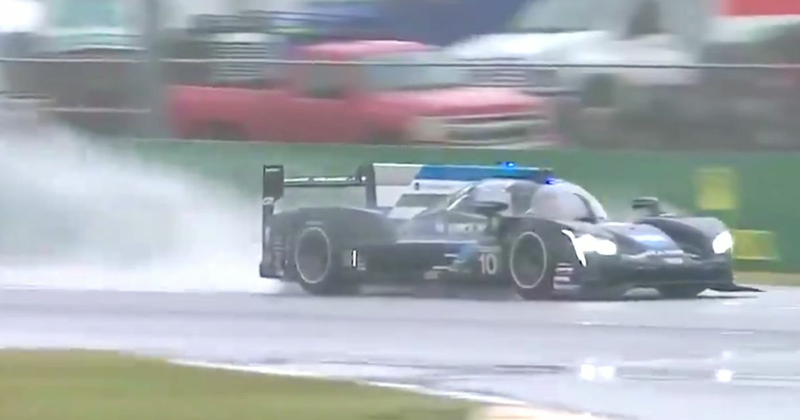 When van der Zande took the wheel overnight, the team slipped back in the order a bit, the result of some unfortunately timed yellows - always a potential hazard at Daytona. Then the rain came. Alonso set an outrageous pace and was entire seconds a lap faster than everyone else and was leading by almost a minute when the yellows were thrown after Tommy Milner’s Corvette aquaplaned heavily into the wall. When the race restarted following the first red flag Taylor continued Alonso’s hard work, regaining the lead and lapping quickly at the front. With three hours left, Alonso jumped in again and after a tight battle with Nasr and a few scares with backmarkers, his consistency prevailed. The red flags came out again, the race wasn’t restarted, and Alonso and WTR won. The LMP2 class was won by the No.18 Dragonspeed car - yep, that’s the car Pastor Maldonado was driving. The No.25 BMW took victory in GT LM, with the No.11 Lamborghini winning in GT Daytona. It means Alonso wins his second major endurance race and only has the 12 Hours of Sebring left to win to complete the triple crown of endurance racing. Was the finish a damp squib? Yes. Were the team fortunate to be in front when the race was stopped? Maybe a little bit. But that doesn’t mean it’s a hollow victory for any of them - quite the opposite. WTR was consistently the best team and the drivers made the fewest mistakes. It was a real team effort - and we’re not just saying that to try and mitigate the Alonso praise, because it really was. All four drivers were superb throughout. You can’t not single out Alonso, though - and we’d do the same if any other driver had driven the way he did. By the end of the race, it didn’t really matter for Alonso’s legacy if he’d won or not. There were times when he was in the car when it looked like he was in a totally different class to everyone else - and remember, many of his rivals have more experience of these cars and of endurance racing. Alonso wants to prove he’s one of the greatest racing drivers of all time and after a drive like that - surely one of the best of his career - it’s almost impossible to argue against it.